The Hermannsburg School of watercolour painting is the longest continuing contemporary Aboriginal art movement, spanning the period from the mid 1930s to today. This important movement was established at Ntaria (Hermannsburg) before moving to Alice Springs, 125 kilometres to the east. Here, the families of the original painters have continued the tradition, living and working in squalid ‘town camps’. 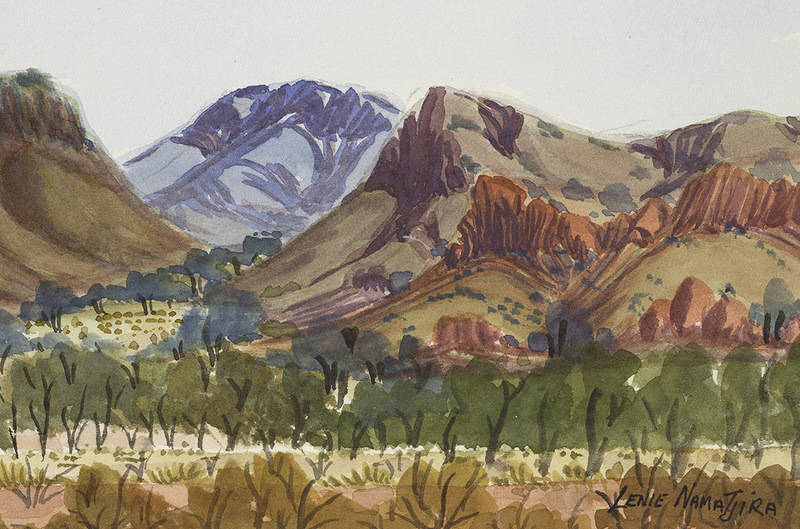 While the movement endures as a significant genre in contemporary Australian art, the Gallery had acquired only a small group of seven works by the current generation of watercolour painters. The acquisition of this comprehensive collection of works from the current and recent generations of artists, courtesy of Glenn Manser, greatly adds to our strong holdings of early works, making the Gallery’s historical to- contemporary Hermannsburg School collection the strongest nationally. 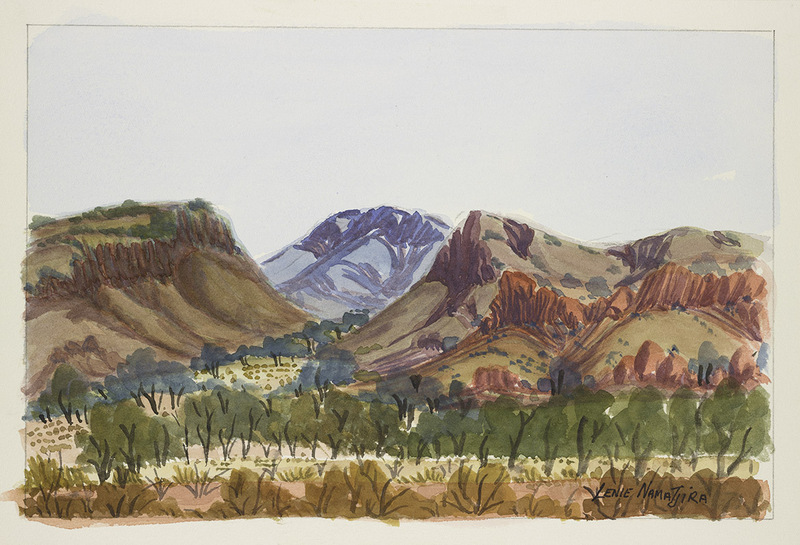 After a rise in popularity through the 1950s and 60s, most artists of the Hermannsburg School moved from the Hermannsburg Lutheran Mission to Alice Springs, effectively shifting the movement. These artists moved to town in search of a better life for their families after restrictions were lifted on the movements of Aboriginal people. However, prejudice prevailed and access to housing and basic services was limited, with many people forced to live in makeshift corrugated iron huts along the river and creek beds on the outskirts of town. Today, many descendants of these artists live in these same town camps around Alice Springs. Importantly, family and tradition have remained strong, allowing the Hermannsburg School to survive today. 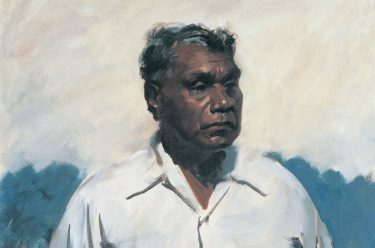 Family remains important in the group, with many artists from the original painting families — Namatjira, Pareroultja, Rubuntja — showing the influence of their antecedents while still developing their own distinct styles. Although the Western Desert acrylic ‘dot’ paintings, which originated at Papunya in the early 1970s, have overshadowed the watercolour tradition in recent times, appreciation is again increasing, mainly due to the dedication of the artists and the creation of the Ngurratjuta Iltja Ntjarra/Many Hands Art Centre in 2002 — the centenary year of the birth of Albert Namatjira, the most well-known artist of the Hermannsburg School. Many Hands provides long-term support for artists from the Western Arrernte region, including descendants of the School. 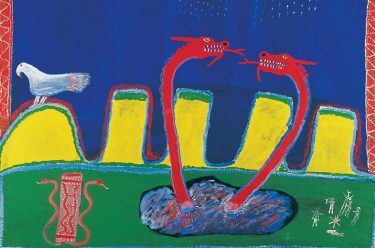 Here, the artists continue painting their country in the Arrernte tradition of their kin, creating strong and dynamic pictorial representations of country. 1 Drawn from ‘Lenie Namatjira: Biography’, Iltja Ntjarra Many Hands Art Centre, Alice Springs, 2017, manyhandsart.com.au/artist/lenie-namatjira, accessed 13 January 2017. Glenn Manser’s support of the Collection’s Indigenous Australian art holdings — to which he has recently contributed 119 watercolours by Arrernte artists from the Northern Territory — reflects his longstanding relationship with the Gallery. The ‘Indigenous Australian Collection: Namatjira Story‘ features early works by Albert Namatjira alongside artworks by those he influenced, including artists from the Arrernte landscape painting tradition, the Hermannsburg Potters and his great-grandson, Vincent Namatjira.